When spring arrives each year, I start thinking about new ways to dress up my lawn and garden. I recently found a great deal on some bags of concrete, so I thought that perhaps I could use that concrete to create some outdoor décor. And so, I started looking for outdoor concrete projects. I didn’t want anything too big or time consuming, just a few DIY concrete outdoor decorations that I could put together pretty quickly. I found 15 amazing DIY concrete ornaments that are perfect for adding some style to the garden. Concrete is such a great material to work with. It is so easy to mix and to mold and when it’s finished, you can paint it, leave it plain or decorate it in any number of other ways. 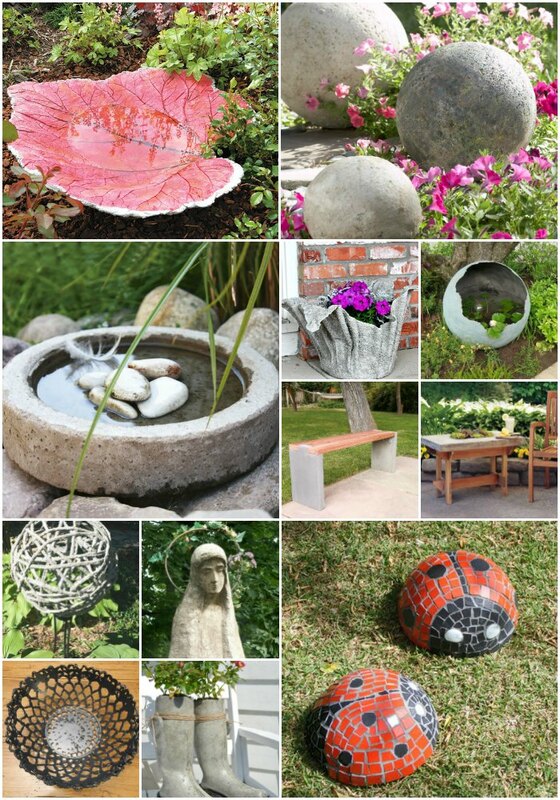 These DIY concrete garden projects are all really simple to make and range from planters and spheres to bird baths and full fledged statues! Oh, and if you want to bring in flocks of birds this summer, be sure to check out this full collection of 23 DIY bird feeders that will fill your garden with lovely birds this summer. 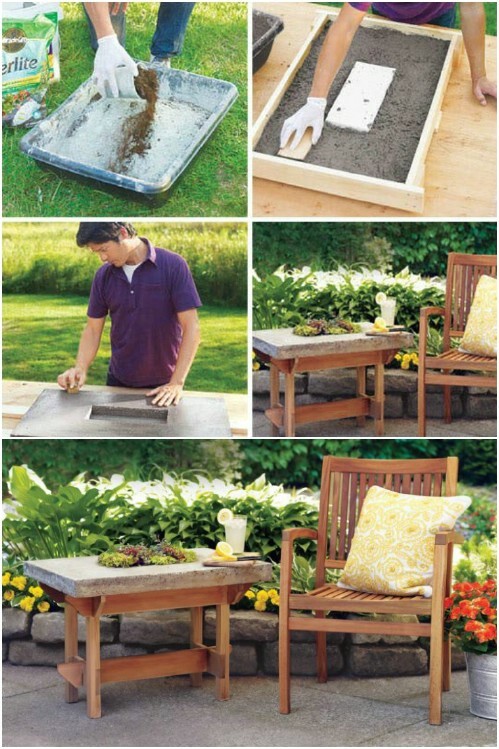 I really do love how easy these DIY concrete garden projects are to make. And, they are all so creative. Even if you haven’t worked with concrete much in the past, you are going to find these so simple and they are all just gorgeous when they are finished. If you have worked with concrete or you just want more practice, be sure to check out these 40 creatively cool concrete projects. You will find something for inside and outside the home in this one! I hope you enjoy these concrete garden projects as much as I have and I hope you find the perfect outdoor décor for your garden area this year! I love the design of these DIY concrete bowling ball planters. You use a bowling ball to mold them and then add your own decorations with glass stones or other embellishments. They are perfect for showcasing your favorite garden flowers or plants and they are made from concrete, so you can put them anywhere in the garden without worries of the weather harming them. 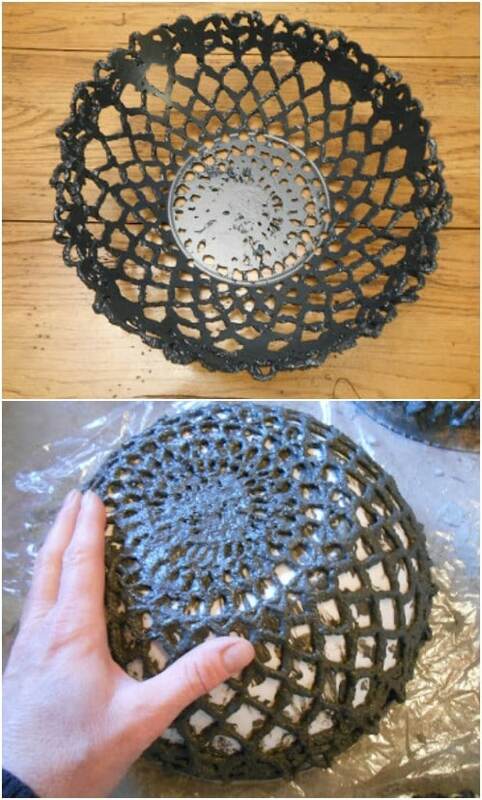 You can turn ordinary cement into beautiful lacy designs with doilies and other crocheted items. If you want something really elegant for the garden, these cement lace items are perfect. Create tiny little planters or concrete baskets for your favorite garden plants or you could use these on the patio or deck to add even more cement décor to your outdoors. They are all very cheap and easy to make. 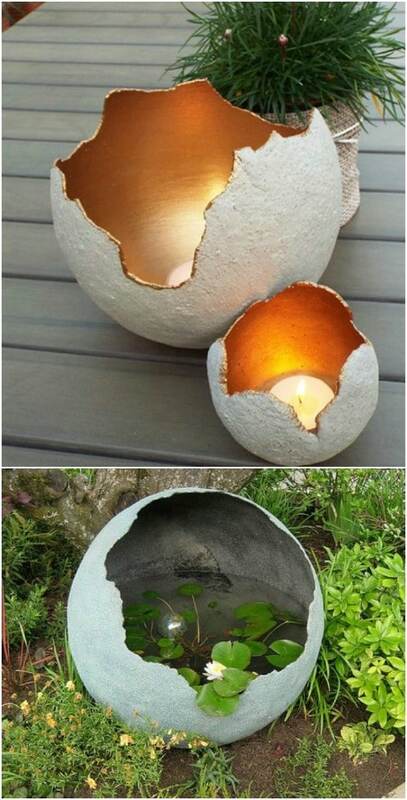 This gorgeous cement planter is made with an old towel. You use the towel to shape the planter and to give it a lovely texture. When it is finished, this is a great one to show off your favorite flowers or you could do a few of these and create quite the garden scene with your DIY creations. 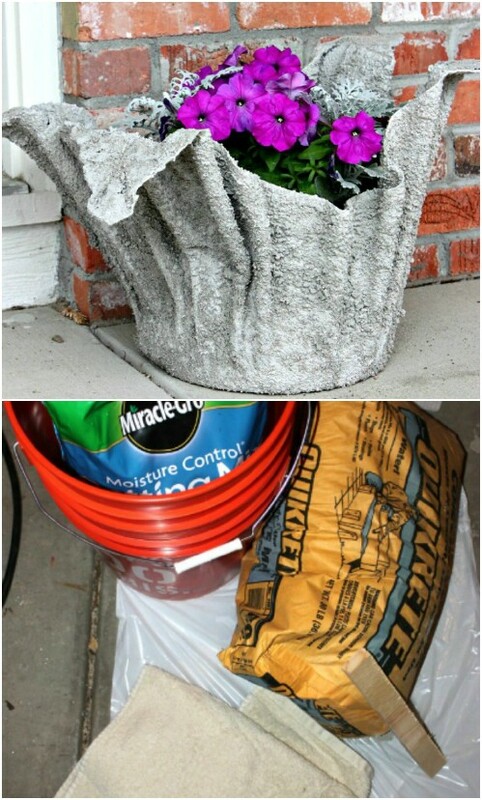 It is much easier than you think to mold concrete around an old towel, too! decorate them when you are finished if you want something a bit more decorative. These are so gorgeous and will look great alongside your DIY garden gazing balls. 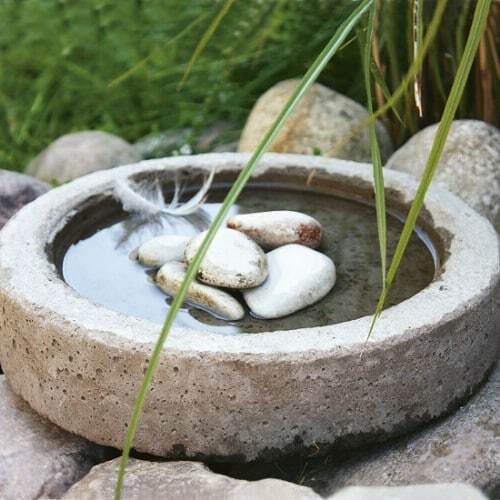 I love bird baths – and I love DIY bird baths even more. This one is molded from concrete and it has a lovely modern look when it is finished. You can just sit this in the garden or put it on a pedestal – however you want to display it. Once it’s finished, your little bird friends are going to love visiting your garden and you are going to love how quick and simple this one is to make. 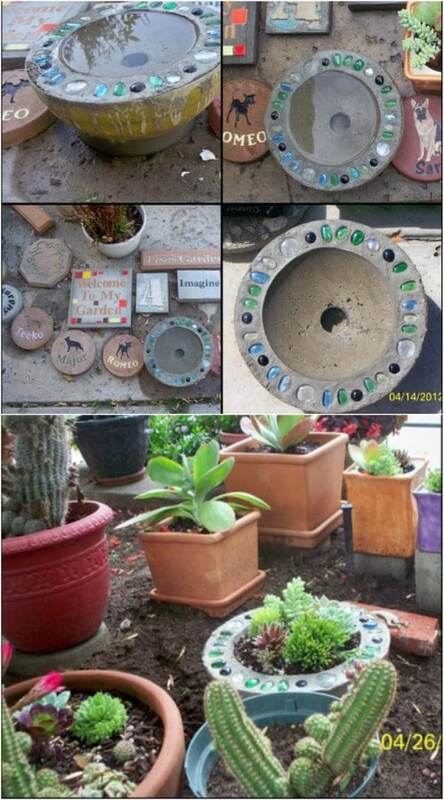 These DIY planters are made from concrete and they are molded with old rubber boots. If you don’t have an old pair of boots that you can use to make these, you can check out your local thrift store. They normally have loads of shoes for around a dollar or so per pair. Once you have the boots, use them to create your concrete mold and make these adorable planters for your garden. 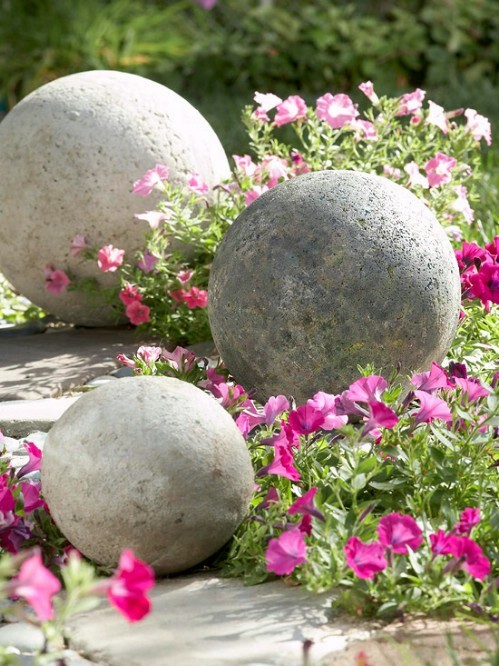 These DIY concrete garden orbs are near genius! You make these with strips of fabric and of course, concrete. The design is gorgeous and sure to create a focal point in your garden. This is such a simple idea and you can do these in any number of sizes and even shapes if you want. They’re quick to make and quick to dry since there is little concrete used overall. 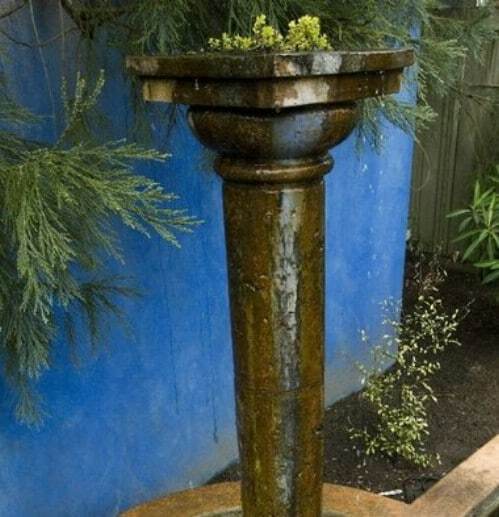 Why not really showcase your favorite plants with these DIY concrete garden columns? You can buy concrete columns at any home improvement store but they are definitely not cheap. These are so easy to make and you can design them however you want. You just need the molds and some concrete. Use these to create an entryway into your garden or just put your favorite potted plants or other garden decorations on them. You could buy a garden statue from any home improvement store but you can expect to spend at least a couple of hundred dollars. Instead, just invest in a bag of concrete and make your own. 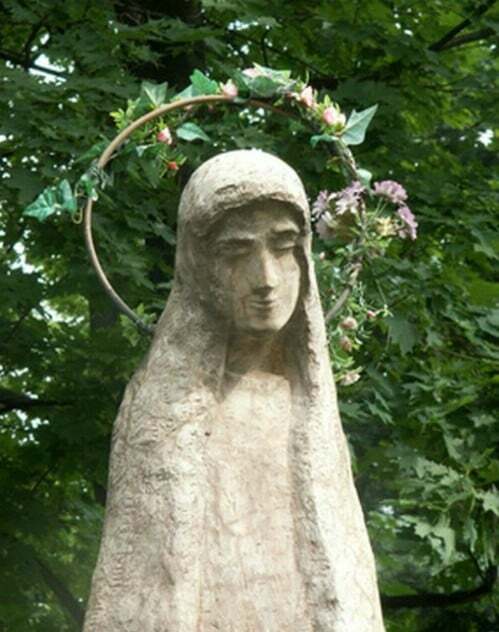 This DIY concrete garden statue project isn’t nearly as difficult or as complex as you may think, and it lets you add a gorgeous garden statue to your outdoors for way less than it would cost to buy one. This little concrete lady buy is really simple to DIY. 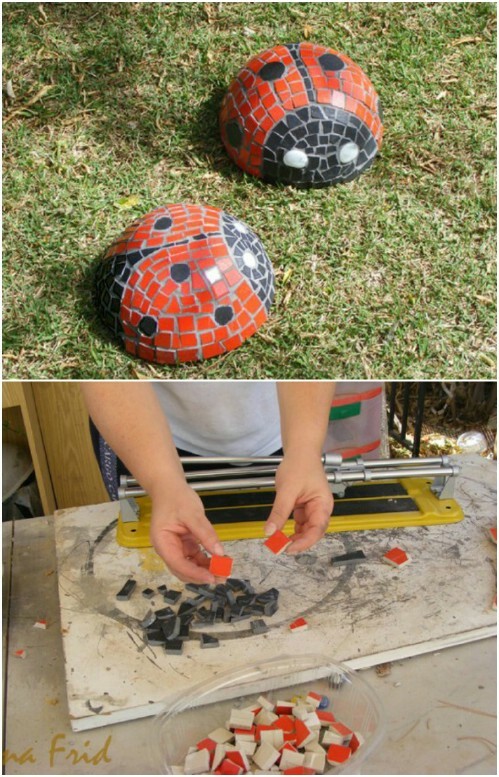 You make the base from concrete and a mold, and there are a number of things that you can use to make the ladybug mold. Then, when the concrete has dried, you add the decorations to make it look like a ladybug with mosaics. Use broken glass or any number of other glass items to create the design. This one is super easy and you’re sure to want to add more than one DIY concrete ladybug to your garden. Surround this concrete ladybug with some DIY golf ball ladybugs to create a little ladybug family! This leaf shaped bird bath is gorgeous when it is finished and it is perfect for adding some style to your garden. 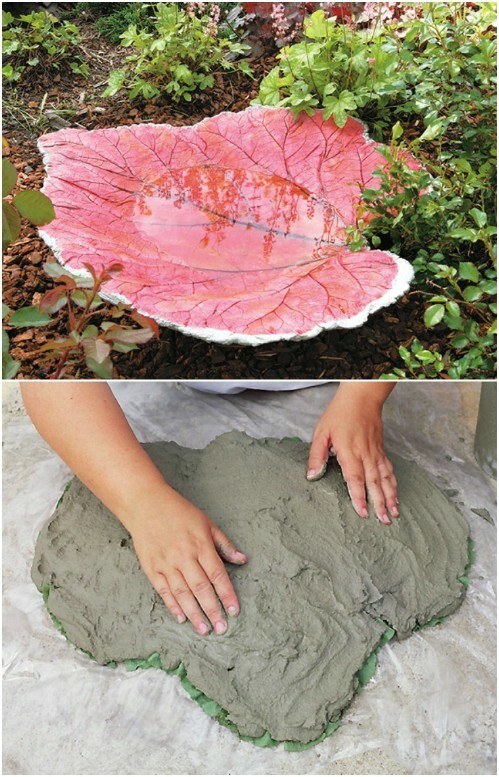 You make this by using a large leaf as a mold and it combines sand and concrete. It even has a base made of concrete that you can mold yourself. You can make this for less than $25, which is a steal considering you will pay more than $100 if you try to buy one like it. 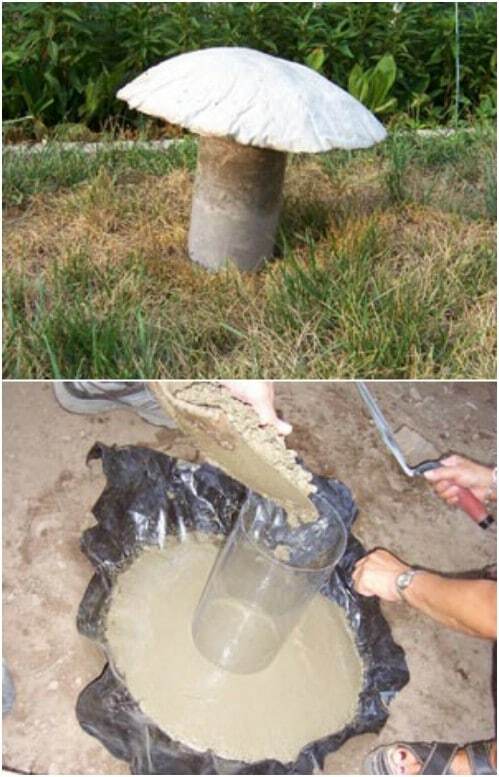 I love mushrooms – in the garden, anyway, and these DIY concrete mushrooms are super easy to make. You use an empty plastic 2 liter soda bottle to create the stem and the top is made from shaping plastic into a mushroom top shape. It’s really simple to make and when you have a few of them finished, you could even paint them in any number of colors to match your existing outdoor décor. I love this side table that you can make for the garden or patio. It is a wooden table with a concrete top that doubles as a planter. Add your succulents to the planter section or you could use it for smaller annual flowers. This would be gorgeous on the patio and it is a wonderful way to showcase those smaller plants that seem to get overshadowed in the flower garden. These little garden spheres have gorgeous golden centers. You could actually paint the inside any color that you want. Once these are finished, they make wonderful planters, candle holders or gorgeous water features. Just be sure to add a coat of waterproof spray to the inside and you can fill them with water and sit them around your garden with floating candles or any number of other water decorations. This wood and concrete slab garden bench is much easier to make than it looks. It is a wonderful addition to your garden, as far as DIY garden benches go. 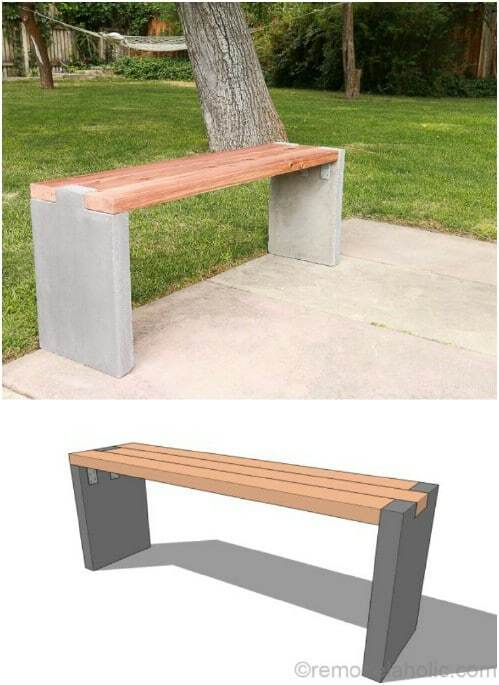 You make this with concrete slabs for the sides and a strip of wood for the seat. There are so many ways to customize this one and make it look different. The slabs are super easy to make and you can use reclaimed wood for the seat if you have any on hand.